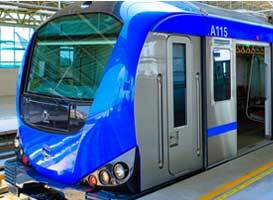 The newest launched metro in the country, the Chennai Metro is a boon to commuters. The biggest industrial and commercial centre in southern India, Chennai is also a major cultural, economic and educational centre. Known as the ´Detroit of India´ for its automobile industry, it is the sixth-largest city and the secondary financial hub in the country, after Mumbai. Further, the city is home to one of the largest expatriate populations in India. Traffic volumes on the roads of the metropolis have been increasing in tandem with its rapid growth. In any urban scenario, the public transport system is an efficient user of space and energy with reduced levels of air and noise pollution. As the population of a city grows, the share of public transport, road or rail-based, should also increase. For a city with a population of 1 million, the share of public transport should be about 40 to 45 per cent. And it is well known, that metro rail systems are superior to other modes of public transport owing to higher carrying capacity, faster, smoother and safer travel, occupation of less space, and their non-polluting nature and energy-efficiency. The need for a new rail-based rapid transport system was felt in Chennai too, and towards this objective, the Tamil Nadu Government implemented the Chennai Metro Rail Project. According to the Chennai Metro Rail Corporation (CMRL), the project aims to provide the people of Chennai a fast, reliable, convenient, efficient, modern and economical mode of public transport, which is properly integrated with other forms of public and private transport including buses, suburban trains and MRTS. A detailed project report (DPR) relating to the Chennai Metro Rail Project was prepared and submitted by the Delhi Metro Rail Corporation Ltd (DMRC). The DPR envisaged the creation of two initial corridors under the proposed Phase-I of the Chennai Metro Rail Project: A 23.1-km stretch from Washermenpet to the Airport and 22 km from Chennai Central to St Thomas Mount totalling to 45 km, passing 32 stations. The project is commissioned in different stages. For Stage I, which was recently launched, the coverage is around 10 km on elevated section from Koyambedu to Alandur, forming part of the Green Line (Corridor 2) and covering the following stations: Koyambedu, CMBT, Arumbakkam, Vadapalani, Ashok Nagar, Ekkattuthangal and Alandur. Apart from Stage I, Stage IA will cover around 10 km, covering all the remaining elevated sections from Little Mount to the Airport and from Alandur to St. Thomas Mount and is expected to be operational by March 2016. The underground sections covering 25 km will be commissioned in various stages during 2016 and 2017. Phase-I extension, from Washermenpet to Wimco Nagar, covering 9 km, is in the advanced stage of sanction. Besides, Phase-II of the Chennai Metro, planned to cover 88 km, mostly underground, is under various stages of approval by the state and central government. The DPR by CMRL for Phase-II has proposed three corridors: Corridor 3 from Madhavaram to Siruseri (41 km); corridor 4 from Madhavaram to Sholinganallur (34 km) and Koyambedu to Luz (13 km). The DPR for these three corridors is being taken up by RITES. Upon full completion, Chennai Metro Rail will be the first metro project in the country to integrate other public transportation systems. The project is expected to reduce commuting time by 75 per cent from one end of the city to another. Installation of platform screen door at underground stations. According to the provisions of the Land Acquisition Act 1894, and to avoid the delay owing to land acquisition issues, CMRL has planned the network along major arterial roads. The location of the stations has been planned on government land. The project has made use of tunnel boring machines for underground construction and segmental construction for elevated work. ¨We have also used balanced cantilever technology; this does not require any support while constructing,¨ adds Ramanathan. This technology is rarely used in India. The project has also used steel girders, in place of concrete. The Guindy-Alandur section of the metro crosses the Chennai Suburban Railway tracks by means of a 105 m steel girder rail overbridge. This iron bridge will be connected by steel girders. It is fabricated and then assembled and goes through the girder, equal to the track, without affecting the trains. ¨Conventional materials and big cranes with high capacity have been used,¨ shares Ramanathan. Land acquisition at certain critical locations. Contract management, particularly liquidity problems faced by contractors. Failure of contractors, leading to appointment of new contractors. Diversion of utilities in collaboration with concerned stakeholders. Acute shortage of trained manpower, thus, CMRL recruited young talent and trained them, particularly in operation and maintenance. Effective traffic management during construction. Construction of obligatory spans across Kathipara interchange by balanced cantilever technique and rail bridge over railway line at Guindy with blocks available only for a few hours at night. The overall sanctioned project cost is Rs 14,600 crore for the 45 km network. Of the project cost, the Centre and state governments are expected to contribute about 20 per cent each; the balance will be met by a loan granted by the Japan International Cooperation Agency (JICA). Phase-II of the Chennai Metro is estimated at Rs 36,000 crore. CMRL has appointed a five-member consortium led by Egis Rail S A, France, as ´general consultants´ (GC) for Phase-I of the project. The other members of the consortium are Egis India Consulting Engineers Pvt Ltd, India; Maunsell Consultants Asia Ltd, Hong Kong; Balaji Rail Road Systems Ltd, India; and Yachiyo Engineering Co Ltd, Japan. The GC assisted CMRL in design, supervision, quality control, safety and contract management for the project. Chennai has now joined the elite club of Indian cities with a metro, alongside Delhi, Kolkata, Bengaluru, Mumbai and Jaipur. Residents now have to wait, probably till the end of 2017, for the other two lines to begin operation and to make the metro complete. Total length: Phase-I 45.1 km, of which, 10 km is completed. Completion date: Work on Stage-I began in late 2009 and was opened for traffic on June 29, 2015. Project consultant: Delhi Metro Rail Corporation (DMRC).